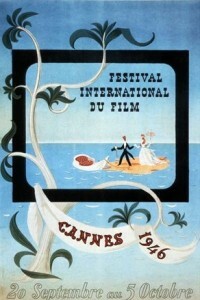 The 1st annual Cannes Film Festival was held from 20 September to 5 October 1946. Twenty-one countries presented their films at the "First Cannes International Film Festival", which took place at the former Casino of Cannes. Only one year after the end of World War II, most of the films were about the war. There arose several technical issues, such as the tarpauline cover blowing away in a storm on the day before the winners were to be announced, the reels of Hitchcock’s Notorious shown in reverse order, and George Sydney’s The Three Musketeers projected upside-down. During the first festival, the jury was made up of one representative per country, with French historian Georges Huisman as the Jury President. With more emphasis on creativity than in competitiveness, eighteen nations presented their films. Eleven of them tied for the first Grand Prix of the International Festival. The Red Meadows (De Røde Enge) directed by Bodil Ipsen, Lau Lauritzen, Jr.
^ "Posters 1946". festival-cannes.fr. Archived from the original on 18 December 2013. ^ a b c "Awards 1946 : Competition". festival-cannes.fr. Archived from the original on 25 October 2016. ^ "1938-1951: The birth of the Festival". fresques.ina.fr. Retrieved 28 May 2017. ^ "1st Cannes Film Festival". intercontinental-carlton-cannes.com. Archived from the original on 20 October 2013. ^ "First Cannes Film Festival". history.com. Archived from the original on 27 December 2013. ^ "1ère Festival International du Film - Cannes". cinema-francais.fr (in French). Retrieved 5 June 2017. ^ "1946 - Cannes, ville ouverte (Cannes, open city)". cannes-fest.com/ (in French). Retrieved 27 June 2017. ^ "Juries 1946: All the Juries". festival-cannes.fr. Archived from the original on 3 March 2016. ^ a b "Official Selection 1946". festival-cannes.fr. Archived from the original on 16 April 2015. ^ "1946 Retrospective, In competition feature films". festival-cannes.com. Retrieved 5 July 2017. ^ "Torment (1944) Release Info". IMDb. Retrieved 5 July 2017. ^ "Hets (1944) / Awards". The Swedish Film Institute. Retrieved 5 July 2017. ^ "FIPRESCI Awards 1946". fipresci.org. Retrieved 24 June 2017.